Ixthus Instrumentation's NEW Infrared range of Block or Rectangular sensors, is now available. 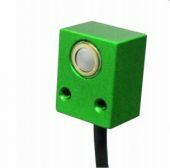 The ETIS-150 block type infrared temperature sensor has a Max ambient temperature from 0 to 120°C and a Measurement distance of 30 to 70 mm. The ETIS-150 Block type infrared temperature sensor can offer a cost effective solution for temperature monitoring.